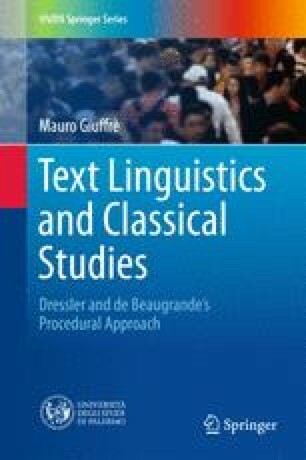 The intention of this chapter is to review the development of linguistic research during the twentieth century in Europe and the United States, in order to show that the genesis of text linguistics as a comprehensive theoretical framework was necessary, considering the events from a post-eventum perspective. Firstly, structural linguistics is presented as well as its main exponents; secondly, generative linguistics is discussed; thirdly, the genesis and the development of text linguistics is presented. Concerning the structural linguistics, the key issues investigated by 4 linguists (namely, de Saussure, Benveniste, Hjelmslev and Bloomfield) are summarized. Concerning the generative linguistics, Chomsky’s strengths and weaknesses are highlighted and the main question of semantics is critically exposed, in order to take into account similarities and differences between generative, interpretative and model-theoretic semantics. When these theoretical issues became widespread, linguistics came to the so-called linguistic turn. Concerning the text linguistics, its history is distinguished in three different phases: (1) the initial stage of the mid-Sixties; (2) the formulation of textual grammars; (3) the elaboration of textual theories. Among these theoretical proposals, the very well-known are the ones by van Dijk and by Petőfi. grammatical theory of verbal texts.